It is possible to add queries, procedures, tables, and views to a database. You can do this during the database integration set up, or after the fact using the functions found in the folder created when a database is integrated with the portal. Adding queries, procedures, tables, and views to a database creates components for use in the Flow Designer. 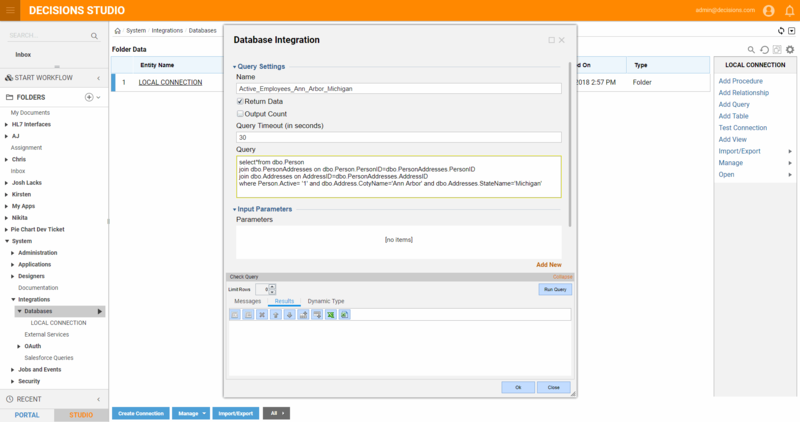 Navigate to the integrated database underSystem > Integrations > Database	. Click on Add Query	. Enter a name for the query, representing its purpose (the name cannot contain spaces). In the Query	field, add the query. If the query returns data, check the Returns Data	checkbox. If a count attribute of the result set is desired, click the Output Count	checkbox. 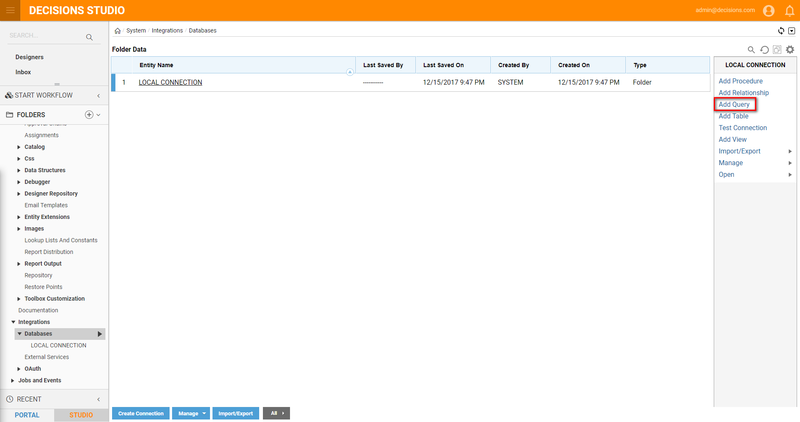 If there is a need to limit the number of records returned, click the Limit Data	checkbox and set the number of records. Click on Run Query	to test the query. The Results	tab appears showing the data returned (if the query returns data). The Dynamic Type	tab shows the data structure of the data returned. Click Save	to save the query. Now, in the Flow Designer , under the components for the database, a component for running this query will be available.